The Asynt compact high pressure single reactors are designed for bench top use and allow easy charging, product recovery, and cleaning. In the smaller and mid-sized model the entire vessel is simply lifted out of the heater by hand! With no elaborate set up required this is a simple but very effective unit. Available in a wide range of standard sizes in two pressure ratings, but also available as a custom item to suit your needs. You can also specify a custom insert to enable parallel reactions within one reactor. Standard low pressure models have design pressure of 55 barg, operating pressure of 50 barg. Standard high pressure models have design pressure of 200 barg, operating pressure of 180 barg. 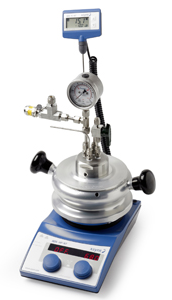 The new MKII 125 ml PressureSyn reactor is now certificated and tested to provide a maximum working pressure of 200bar and temperature of 200C. The easy to open clamp mechanism also features a unique Safety Key designed by the chemists and engineers at Nottingham that does not allow the vessel cover to be removed without first releasing any residual pressure. Each Safety Key and vessel clamp are unique therefore ensuring that it cannot be undone with a spare key, only the Safety Key that is used to release any residual pressure of the reactor in use will open the clamp. Even with an operator opening the standard pressure relief valve in the correct manner it is possible to have a small blockage in a valve leading to some residual pressure. This required a safety design feature to be developed for the reactors to ensure that this was not possible; therefore each Safety Key valve assembly has a pin at its tip ensuring that when extracted will leave behind a small hole for any residual pressure to be released. Each individual reactor is tested to 400bar pressure, witnessed and certificated at this pressure by Zurich Insurance, giving our customers secure knowledge that this reactor when in use at its maximum it is actually very under stressed. Each reactor is hydrostatically tested and observed under pressure to 400 bar by Zurich Insurance. Fits a specially designed DrySyn adapter base plate for use on a standard magnetic stirrer hotplate, to 200°C. 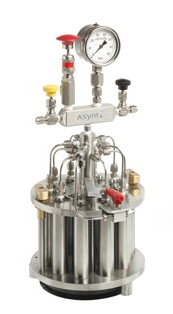 The new Asynt Parallel High Pressure Reactor is a cost effective lightweight unit suitable for numerous stirred or non stirred applications including hydrogenations and applications where air sensitive materials are used or any other reaction where pressure or temperature are required. 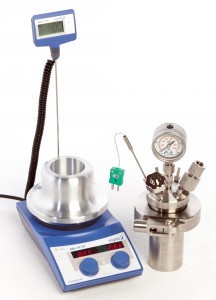 It offers the user to screen 10 x 30 ml reactions at pressures of up to 100 bar. Can be used with a standard hotplate stirrer or can be customised to have multiple temperature zones.